Place your documents at eye-level to help prevent neck strain and improve efficiency! 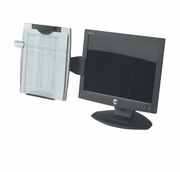 Copyholder mounts to either side of your computer screen to save desktop space and features adjustable tilt (30 degrees up and 30 degrees down) to customize your viewing angle. Line guide glides up or down and swings out of the way when not in use. Copy clip holds up to 150 sheets of A4/legal size paper.